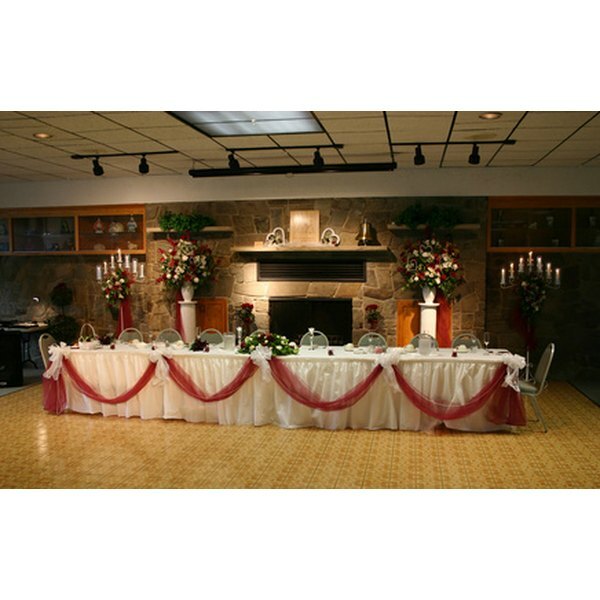 A long, rectangular head table setting is traditional at a wedding. The bride and groom are seated at the head or top table at their wedding reception. The couple sits at the center of the back of the table facing the wedding guests. Their parents or wedding party members are seated with them. The guests' tables typically are decorated to match the head table on a smaller scale. The head table is decorated and set up to coincide with the formality of the event and wedding reception theme. Visit the reception venue to plan where the tables and significant displays, including cake, gift and food tables, will be set up. Choose a raised area or focal area for the placement of the head table. Write down the measurements of the tables to determine the size needed for table coverings. Choose colors with which to decorate the tables at the reception. 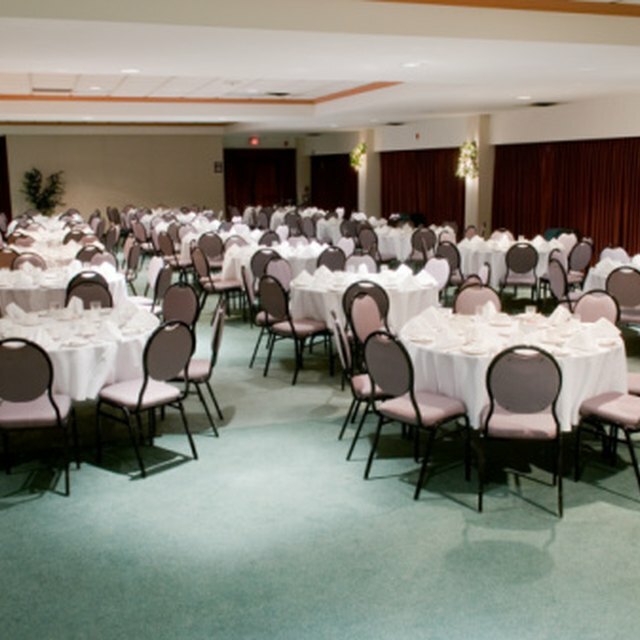 Order, buy or rent tablecloths for each table. Select a style appropriate for casual, semi-formal or formal reception decor. Decide if the wedding bouquets are to be incorporated into the table centerpieces. Set up the head table at the reception site. Be sure there is plenty of walking room and seating space around the table. Cover the table or set of tables with tablecloths. Tastefully decorate the front of the table with swags of netting, garlands or flowers. String white Christmas lights underneath the table skirting to illuminate the table, if desired. Add low-lying centerpieces to the table-scape. Wedding bouquets can be set into vases or displayed in attached bouquet clamps at the front of the table. Set the table with dishes, glassware, silverware, salt and pepper shakers according to the formality of the meal. Add napkins and favors. Sprinkle the table with confetti or chosen decorations. Start a seating chart before the first RSVP arrives in the mail. Decide who will be seated at the head table.